On 13 September 2015, U.S. 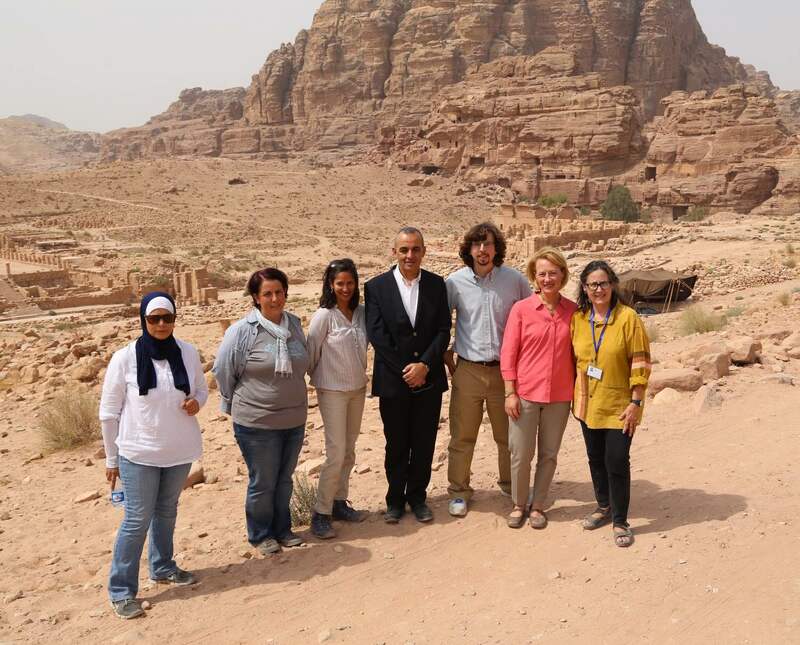 Ambassador to Jordan Alice G. Wells launched a grant awarded under the Department of State’s Ambassadors Fund for Cultural Preservation (AFCP) to expand conservation of the Temple of the Winged Lions. The grant, totaling $200,000, was awarded to the American Center of Oriental Research (ACOR) in partnership with the Jordanian Department of Antiquities and the Petra Archeological Park. Representatives from ACOR, the Jordanian Department of Antiquities, the Petra Development and Tourism Region Authority (PDTRA), and the local community attended the launch. Key attendees at the AFCP launch event included, from left to right, Eman Abdalsalam (TWLCRM team member and Sela president), Elena Ronza (TWLCRM co-director), Ragini Gupta (U.S. Embassy Public Affairs Officer), Dr. Emad Hijazeen (PAP Commissioner), Dr. Glenn J. Corbett (ACOR Associate Director and TWLCRM Co-Director), Alice G. Wells (U.S. Ambassador to Jordan), and Barbara A. Porter (ACOR Director). Photo by Eric Barbee, U.S. Embassy Press Officer. The grant will support the second phase of conservation at the Temple of the Winged Lions, and is part of the United States’ continuous support for this site since 2012. In its first stage, the project provided nearly 700 employment opportunities for the local community and earned the Archaeological Institute of America’s 2015 Award for Best Practices in Site Preservation. In the course of the two hours on site, the ambassador was taken to several stations where specific work was explained (documentation of the walls, sifting, sorting pottery and the cella itself which is a prime focus of work for this grant). Afterwards there was a gathering in the nearby café for local team members, staff of the Petra Archaeological Park and DOA, and a few men who had worked with Philip Hammond on the original American Expedition to Petra project. In the café, Ageelah of the TWL project spent considerable time with the Ambassador and had pride of place beside her. Ambassador Wells (center) sits with current and former members of the TWLCRM team during the launch ceremony for the AFCP continuation grant. Photo by Qais Tweissi. Since 2001, the United States’ Ambassador Fund for Cultural Preservation (AFCP) has helped preserve many of Jordan’s archeological sites, providing over 1.6 million USD for 13 different sites. This program has helped preserve Jordan’s cultural heritage and supported Jordanian tourism and the crucial role it plays in Jordan’s economy. The AFCP is only one part of the U.S.-Jordanian partnership in tourism, with the United States providing nearly $90 million to support the development of Jordan’s tourism initiatives at large. This article is drawn from the press release “U.S. Support for Petra and Jordan’s Cultural Heritage Continues” that was issued by the U.S. Embassy in Amman, Jordan on September 13, 2015.